Six months ago, 86 year-old James Acker died of injuries after being beaten in his long-term care home. Today, his daughter Tammy Carbino is still trying to process what happened. Tammy delivered this speech about the great life and tragic death of her father to raise awareness of the need to protect residents in long-term care. I’d like to pay tribute to my favourite senior today, one who will always be near and dear to my heart – my father, James Acker. For 86 years Dad graced the earth with his contagious smile, good humour and upbeat attitude. He was born on a farm in Nova Scotia and his small-town values and charm stayed with him all his life. He was a kind-hearted, generous and gentle man and anyone that knew him had only good things to say. My father and I shared a special bond. You could say I was daddy’s little girl. Even after I was married and had my own family, Dad would come to stay with us on weekends and he and I would go for manicures and pedicures and spend several hours enjoying each other’s company. When my father was diagnosed, I didn’t dwell on his diagnosis or really think about what it would mean for him and our family in the future. I was simply grateful that his happy and kind spirit prevailed and that his mood seemed unaffected. A year later, to celebrate his 80th birthday we even took a father/ daughter trip back to his hometown – it was a special trip down memory lane. It was the trip of a lifetime for Dad and now, as I look back, I realize it was for me too. 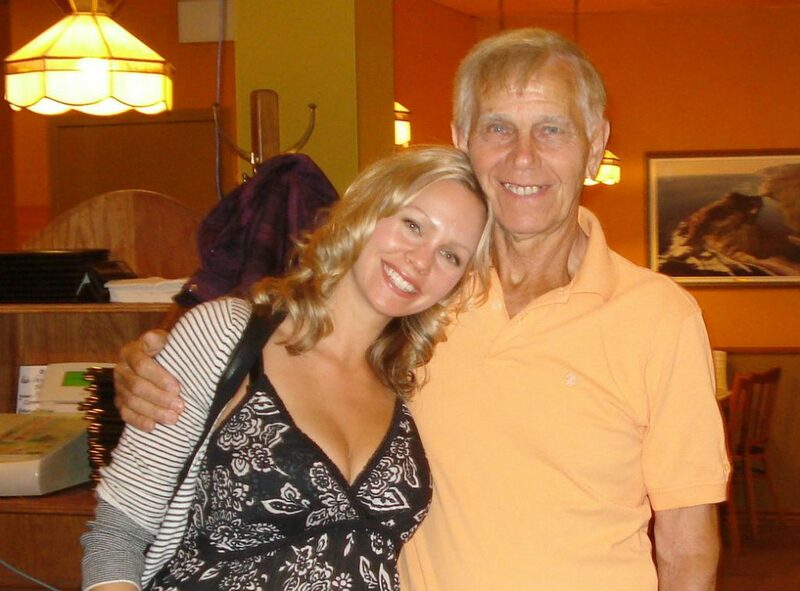 [Photo: Tammy and her father, James, in Nova Scotia. 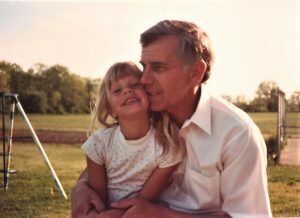 ]As my father approached his late 70s, I started to notice some changes; he sometimes forgot a name or couldn’t recall a word. From time to time he would become disorientated, in familiar places. Shortly after this started happening, he was diagnosed with Alzheimer’s disease. As the disease progressed; he lost more words; communication became more difficult and he required constant assistance with simple, everyday tasks. My mother (his primary caregiver) had a difficult time coping with the progression of the disease and was beginning to burn out. 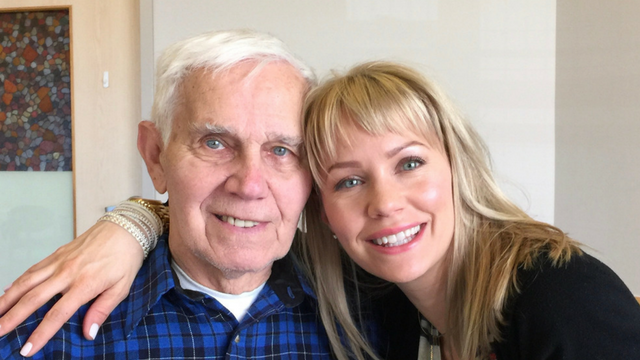 My father came to live with my husband, our son and I, but after just a few months, I realized that I would not be able to care for him at the level he required. He returned home with my mom for almost a year, until it became very clear to us that he was no longer safe in his home. One day he wandered from his property and walked over four hours away from his home. He was picked up by the police and from that moment forward we were pressured to find a long-term care home, that would keep him safe. This was the most difficult decision for our family to make, but after being pressured by the police and the medical community, we felt as though we had no other choice. We settled on St. Joseph’s Villa, in Dundas Ontario (a Long-Term Care home that was close to Mom). Fortunately, my father adjusted very well to his new environment. My mother and father rekindled their relationship as husband and wife again, as she was no longer his primary caregiver. Together, at the Villa they attended dances, went for ice cream and enjoyed a new social circle of friends. However, during his ten months at the Villa we weren’t without challenges and frustrations; his clothes and personal belongings would often go missing from his private room, even though they were kept in a locked closet and mom did his laundry. On many occasions, we’d find other residents and their belongings in his room. One evening a female resident entered his room and ripped off his undergarments, while he was laying in bed. The resident became so enraged that my father had to be removed from his own room because staff could not persuade her to leave. Although my father was never physically hurt, on this occasion, he was violated in his own room and the assault wasn’t documented or reported to our family for a full two days later. This is when we began to feel concerned about my father’s safety at the Villa but absolutely nothing could have prepared us for what happened, on the night of Friday, January 28th, 2017. 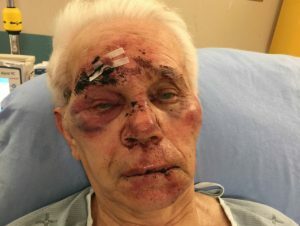 My father was violently attacked at 2 am while sound asleep in his private room at St. Joseph’s Villa. We’ve been told, at 2 am a resident left his room and walked down the hall toward my father’s room, which was approximately 4 rooms away. A personal support worker (PSW) saw the resident leave his room and called out to him as he walked down the hall, however he was unresponsive to her calls. The resident entered my father’s room and began to viciously punch, bite and beat him repeatedly in the face, head and hands. The PSW followed the resident into my father’s room and yelled at the resident to stop but could not persuade him off my father. She then yelled for assistance, at which time another PSW entered my father’s room and together, they screamed and yelled at the attacker. Essentially, the two PSW’s who witnessed my father being beaten to death had neither the means or training to stop the attack. Further investigation revealed that staff did not follow proper policy and procedures. My father spent the following eleven weeks at the Hamilton General Hospital. Throughout the first couple of weeks, we were unsure if dad would survive this horrific attack. Due to the severity of the beating he could barely open his mouth, let alone eat or drink and it was discovered that he had suffered a brain injury and had bleeding in his brain. Thankfully, the bleeding in his brain stopped and within a few weeks, his cuts and bruises healed. He was eating, walking and talking again. And we even celebrated his 86th birthday just one month after the attack. This miracle gave me strength and courage to speak out on my father’s behalf and for all seniors. I reached out to the Media to share this tragedy and to CARP for guidance and support. After my father had healed, I was in complete disbelief to learn, that the expectation was for him to return to St. Joseph’s Villa, to the same room….. without any guarantee that his attacker would not return! CCAC (the gatekeepers of the LTC) told us that “If you have a perfectly good bed and give it up – you go back to the bottom of the list”. For obvious reasons, we decided my father would not return to the Villa and, due to our decision, we were thrown back into CCAC’s convoluted network. 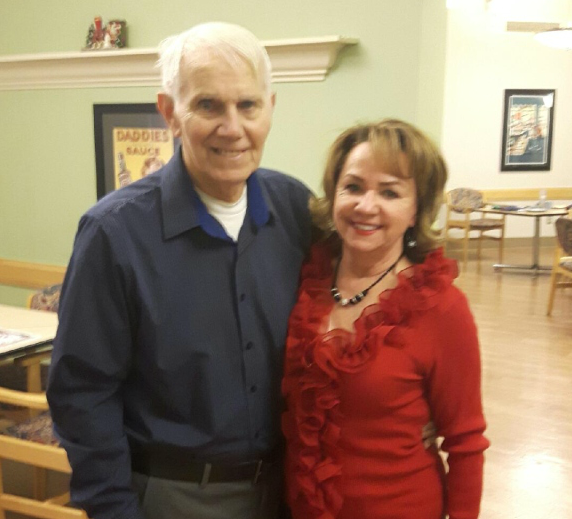 I began to search for a new, safe long-term care home for Dad. I toured over ten homes in the area and was horrified when all but one home told me that they “Couldn’t promise me that a similar incident wouldn’t happen in their facility too”! At this point I realized that what happened at St. Joseph’s Villa wasn’t an isolated incident …Our current system is broken, and our family members are not always safe! Disgusted and enraged by the lack of safety standards within long-term care homes, I partnered with CARP and together we took our concerns to Queens Park, with the support of Ontario NDP, Member of Parliament, Teresa Armstrong – a critic of long-term care. Teresa presented my story in the House of Commons and demanded answers from the Minister of Health and Long-Term Care, the Honorable, Dr. Eric Hoskins. She announced during question period that I had reached out to the Minister but had been denied the opportunity to speak with him and in that moment requested the Minister meet with me privately to hear more my story. He agreed. In that meeting, I was surprised to learn that the Minister was only vaguely familiar with what had happened to my father and that he had yet to see the pictures of his bloody, beaten face – even though it had been all over the newspapers, radio and television, for the past six weeks. I shared with him that I had toured ten homes and all but one said they couldn’t guarantee my father’s personal safety. The Minister’s response to this was… “We’ve increased the number of inspections”. My response to that was “inspections won’t protect our family members from resident on resident violence” However, in that meeting he did promise to help get my father placed into a safe home immediately. Sadly, my dad remained in the hospital and died as a result of his injuries, four weeks later. The cause of his death and has been confirmed a non-culpable homicide. This means the attacker is not criminally responsible for my father’s death (as he too, is a person living with Alzheimer’s disease), but the system sure as hell is! This is my father’s story and he is only one of millions of seniors in Ontario, this story is relevant because I know, so many of you have had similar experiences or know someone who has. Neglect and abuse in LTC is systemic and it’s completely unacceptable! The number of Canadians living with dementia is 564,000 and this number is expected to increase to almost 1 million over the next 15 years. I share these facts with you, not to frighten you but to impress upon you the urgency for change. Going to the media and sharing my father’s story, I believe has helped shed light on the unacceptable treatment of seniors. In fact, recently, our cause has had a victory. 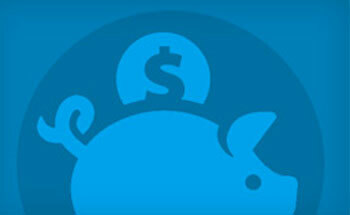 CARP’s Long-Term Care campaign request was accepted. On June 26th, the Attorney General and Minister of Health and Long-Term Care announced an independent public inquiry into the Wettlaufer case and since, the scope of the inquest has been expanded to include all aspects of long-term care. 2. Failure to comply with an order. Read the Ontario Government’s Latest Announcement on Proposed Legislation to Protect LTC Residents. We need to speak out to protect those in long-term care who can’t speak for themselves. That’s why I’ve agreed to Chair CARPs campaign to protect residents from harm, and why I’m asking you to join – or donate – to CARP today. A single voice may not be enough, but TOGETHER we can make a difference! Thank you very much and a special thank you to the good people at CARP; especially Moses Znaimer, Wanda Morris and Anthony Quin and the rest of their team, who were integral in helping my family navigate through the terrible tragedy we experienced in long-term care.